If you are planning a fall foliage trip with your RV, you might think your only good choices are confined to the Northeastern U.S., but that’s not true. There are great places to see autumn leaves all over the United States. Here are just a few RV destinations that you should try for leaf peeping. It’s difficult to beat the Blue Ridge Parkway during leaf season. This isn’t just a road through a lovely, rural area – it’s a road that was created specifically to be a beautiful scenic drive! Winding for 470 miles through Virginia and North Carolina, the Parkway travels through open farmland and high into forested mountains. Look for the leaves to be at their peak from mid- to late-October. Changes in elevation and angles of sunlight give you a better chance of seeing good leaves if you drive farther along the Parkway. If you want to relax overnight among the leaves, there are plenty of campgrounds along the way as well. This Great Lakes RV destination begins at Traverse City, Michigan, where you head north to first visit the Old Mission Lighthouse set on a peninsula in the middle of Great Traverse Bay. After that there will be wineries, sand dunes, more lighthouses, apple picking, and of course, fall foliage amidst evergreens. The leaves should be at their best from mid-September to mid-October. If you want to relax in a beautiful spot, try one of the campgrounds at Sleeping Bear Dunes National Lakeshore. Another fall foliage destination that’s made even more beautiful by the presence of water is Missouri’s Lake of the Ozarks. A man-made body of water, Lake of the Ozarks is approximately 92 miles long with more than 1,100 miles of shoreline. 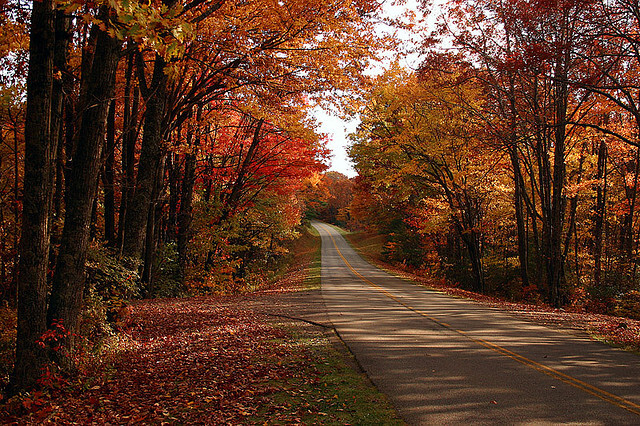 Adjacent to the lake are rolling hills and the Ozark Mountains, made all the more beautiful by turning autumn leaves. Lake of the Ozarks State Park – the largest state park in Missouri – surrounds an entire “arm” of the Lake. Why not make yourself a nice little home in the center of all this beauty at one of the four campgrounds at the State Park. The Section 4 campground is located right on the water, plus it’s adjacent to a marina and boat ramp. 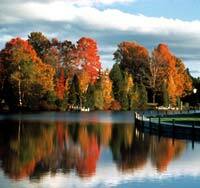 You can take a fall foliage tour from the water – with your own watercraft or a rental. Just remember to make your reservations for Oct 26 through Nov. 5 for optimal leaf viewing. You can’t seriously discuss autumn leaves and forget Vermont. In Vermont, you will get the full range of fall colors – yellow, orange, red and red-purple – set against the quaint backdrop of rural, semi-rural and historic America. Of course, the good people of Vermont didn’t invent the fall season, but they’ve done a great job of making Vermont a beautiful place to come back to again and again! If Vermont is your fall RV destination, you’ll want to start at Waitsfield at the Mad River Byway. 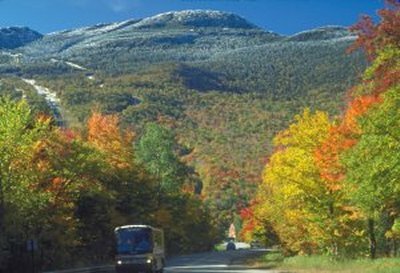 Enjoy your drive all the way to Stowe, Vermont. Stop and have some cider along the way. Remember, you’ll want to be in Vermont from mid-September through late October for prime leaf showing. Wherever your journeys take you this fall, share your pictures with us! Join us on Twitter or Facebook. We’d love to live vicariously!